Today is one of those posts that I am just so excited about, I am sharing it with you less than 12 hours after I finished it. I just can’t hold out! Now that my first Christmas mantel is complete, I am moving on to the other side of the fireplace. Since I just updated it with stacked stone, I wanted a really rustic look (similar to last year) and so I knew I was going to make another one of my (infamous) pallet signs. Assembly was exactly like the previous versions, and once again I stained the wood dark brown so the design would show up well. So far I’ve only stenciled and painted the previous designs so this time I wanted to do something more dimensional. I had a couple bags of wood slice vase filler left over from my dollar store wood slice pumpkin project and I thought they would be easy to work with. I didn’t add anything else. (See? Easiest tutorial ever!) I propped the sign up on my mantel (the full reveal is coming up this weekend) and that was it. This has definitely become one of my most favorite projects I’ve done. I will be sad when the holidays are over and I have to take it down. 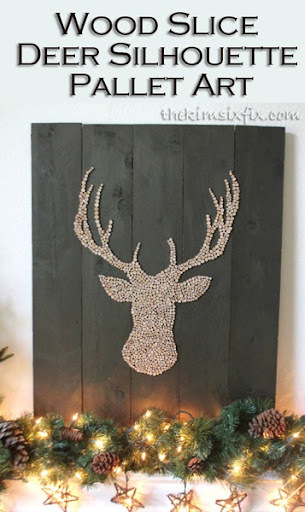 I may need to go with a ‘hunting lodge’ theme living room, so I can leave it up all year round!